Did you know that trampolining is 68% more effective than your half hour jog? Just 10 minutes of trampolining can achieve the same health and fitness benefits as your usual run, and its much more enjoyable. The increase in muscle strength and pulse rate allows the oxygen to be efficiently pumped around the working body more effectively. Although trampolining is a high impact and intensive exercise routine, it causes very little joint impact. The trampoline pads soak up the vertical acceleration and deceleration of a jump (up to 80% of the shock), whereas hard surfaces such as the road do not have this effect. Therefore, trampolining protects the joints while also exercising the muscles. Trampolines are wonderful exercise accessories because they are convenient: they are located in one place, easy to get to, offer privacy and do not require any specific exercise gear. 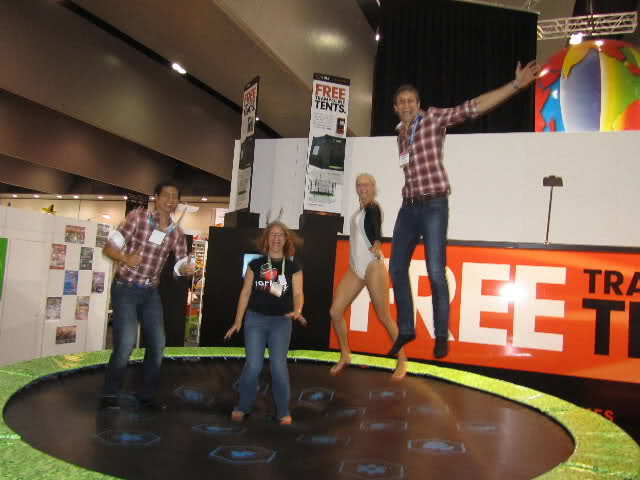 Another positive aspect of trampolines is that they are designed for absolutely anyone and everyone! Plus they're a lot of fun. If you're looking to lose weight, increase your fitness levels or simply have fun, a trampoline is the perfect tool. So if you're looking for a great excuse to buy some new exercise equipment come and have a look at some of our Vuly Trampolines set up in our showroom located in Wakerley or give our friendly staff a call on 1300 667 514.